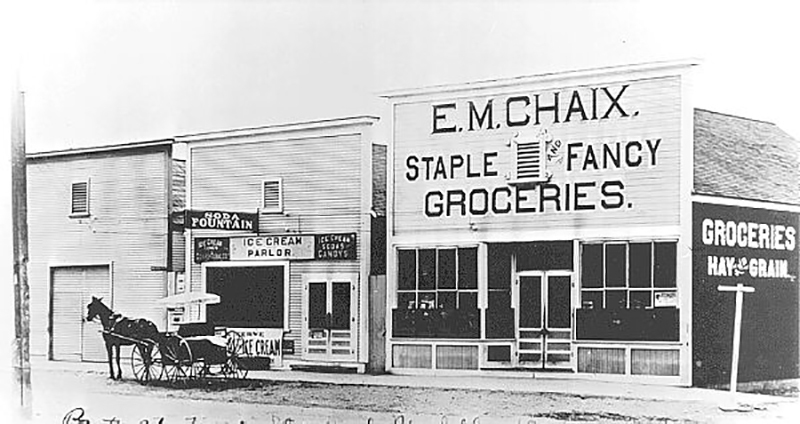 SCVHistory.com AP0719 | Newhall | Emile Chaix's Grocery Store, 1910s. Emile M. Chaix's 1913 grocery store near the southwest corner of 8th Street and Spruce (now Main), circa 1916. 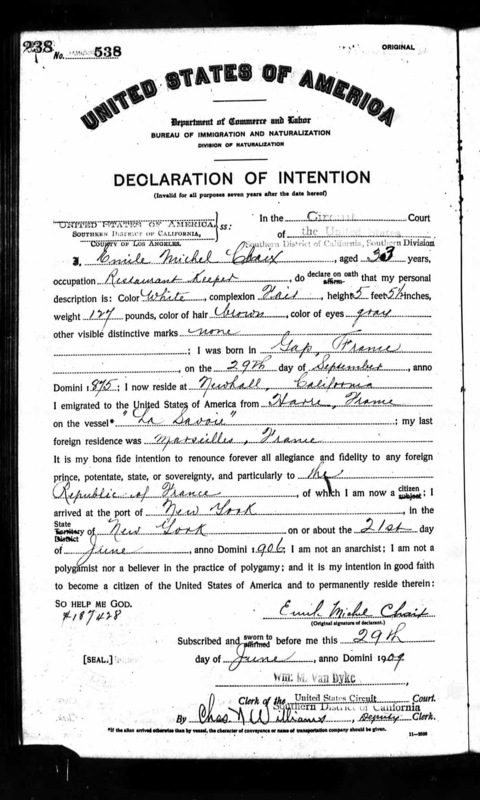 Born in the town of Gap at the foot of the French Alps on September 29, 1875, Emile Michel Chaix immigrated to the United States via New York on June 21, 1906, joining his wife, Celina R. (Boyer), who immigrated the previous year with other relatives when she was 20. The couple came to Newhall and started a family. Locals pronounced their name "Checks" and often omitted the terminal "e" from "Emile." According to Reynolds (1992:73), in 1908, "Emil Chaix took over the operation of the appropriately named Derrick Saloon on Main Street" — appropriate because it catered to oil workers from Mentryville, which was traditionally a dry town. 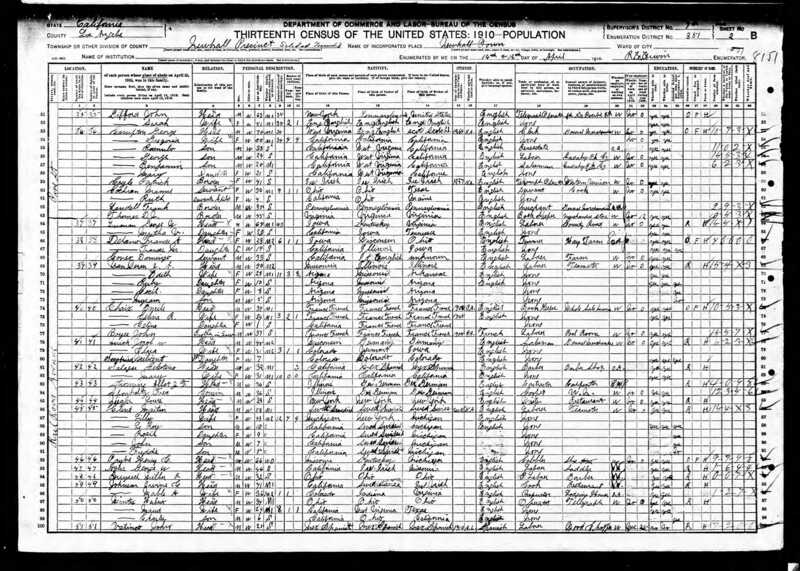 His brother-in-law (Celina's older brother), John Boyer, probably worked at the saloon; he lived in Newhall where the 1910 U.S. Census lists him working in a pool room. In 1913-1914, when the highway (Railroad Avenue) was improved and major property owner William Mayhue raised rents, Emile Chaix, along with other Newhall merchants, moved one block west to Spruce Street, establishing it as Newhall's Main Street (which it was finally named in 2007). There is some question as to whether Chaix merely moved his business or the saloon building itself. Perkins writes in 1958: "Moving from the square started about 1913. Emil Chaix then picked up the Derrick saloon and shoved it over to the southwest corner of San Fernando road, Spruce and Eighth Streets." Perkins' informant was Emile's widow, Celina. Contrarily, Reynolds (ibid.) writes: "Chaix moved to the southwest corner of 8th and Spruce and opened a grocery store." The latter is more likely. The grocery that Chaix opened about 1913 on Main Street does not look like the Derrick saloon, and still today, it appears the saloon has remained in its original 19th-century location. The building and the name has changed — it was called the Rendezvous during the latter part of the 20th Century — but the "bones" are still there as of 2018. Emile Chaix built a home for his growing family in 1915 at 24338 Walnut Street. He built another "four-room bungalow" in 1925 at 22614 8th Street as a rental (The Signal, Feb. 5 and Feb. 26, 1925). Both structures still exist as of 2018, although neither has any kind of official historic protection. The construction of the latter house coincided with the time in 1924 or 1925 when Chaix and a partner obtained a Firestone tire franchise and opened a vulcanizing shop at or next to Chaix's grocery, near the southwest corner of Spruce and 8th (see The Signal, May 28, 1925). On Sunday, December 18, 1927, a fire that started in the Staudy (aka Staughty) pool hall spread to "the Chaix building occupied by E.R. Holcomb's barber shop and the Motor Stage Cafe" (The Signal, December 22, 1927). Chaix rebuilt in brick, starting work the second week of January 1928. Per The Signal, January 19, 1928: "The building will be of brick, 50x50 with fire wall division through the middle, making two rooms 25x50. The front will be stuccoed, mission style. The total cost will be in the neighborhood of $6,000." Whether Chaix's vulcanizing shop was new brick construction in 1924-1925 and his other wooden buildings burned — or his vulcanizing shop was one of the wooden buildings that burned — we just don't know. (It's not stucco-sided.) If the latter, then the photograph of Chaix standing in the doorway to his vulcanizing shop would be extraordinary, because it would show him in one of the last moments of his life. Chaix didn't live to enjoy his new buildings. He had been in ill health for some time, in and out of the French hospital in Los Angeles where he died at age 52 on February 17, 1928 — one month shy of the St. Francis Dam disaster. 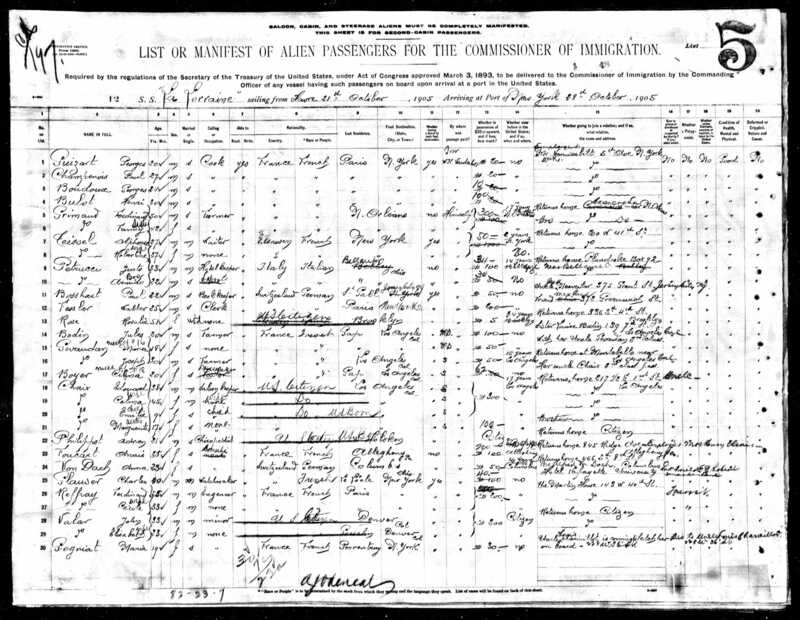 Predeceased by two children, he left behind his wife, Celina; two daughters, Celina and Bertha; two brothers, Eduard Chaix and Joseph Chaix; and two sisters, Mrs. Adrien Blanchard and Mrs. Elilie Roman (The Signal, February 23, 1928). He was buried in the Calvary cemetery in Los Angeles. AP0719: Lo-res scan from copy print. Needs rescan.